The cost of a college education continues to accelerate past the rate of inflation, forcing more and more aspiring students to borrow money to achieve their dream. What is worse is the more money that becomes available for student loans and the more that is borrowed, the greater demand drives up tuition costs, as the supply and demand curve dictates. The numbers in terms of student loan debt are startling, seemingly much worse than many of the bubbles we have seen in recent years. Here are five statistics that ought to make you cringe. The numbers are so stratospheric they are mind-numbing, which is part of the problem. When we talk about numbers like $1.4 trillion, the total amount of student debt outstanding among 44 million borrowers in the United States, most people can’t wrap their minds around it. That is a 300% increase in the amount of student debt just in the last eight years. The same thing happened with credit card debt, which sailed past the $1 trillion mark a decade ago (BTW, student loan debt recently surpassed credit card debt as the number one consumer debt in the U.S.). It’s so big that people can’t understand the problem except if they see it at a more personal level. It’s a lot different when we talk about the average college graduate, who could be you or someone you know who is carrying around student loan debt. 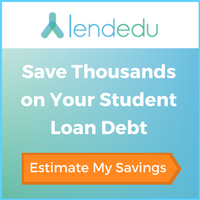 According to LendEDU, more than 60% of students left college in 2016 with an average of $28,400 in student loan debt. That is easier to understand, because most people know how that amount of debt could affect their lives. While the size and scope of these numbers are alarming, it is what runaway student debt is doing to people’s lives that will make you cringe. As of 2016, more than 7 million people, or just under 2% of the U.S. population, have defaulted on their student debt. That number is expected to grow as 40% of all student borrowers are behind on their payments. A default on a federal student loan is a serious matter, much more so than credit card or any other type of loan default. That’s because a federal student loan default can literally follow you to your grave. Whereas other types of consumer debt can be discharged in bankruptcy court, federal loans are allowed to live another day. If it is not repaid by the time you retire, the government can garnish your Social Security benefits. If that isn't enough whenever you unfortunately die, the government is first in line to collect it from your estate. Student loan borrowers who manage to make their payments still face an uphill climb just to achieve the level of financial security enjoyed by graduates who didn’t need to borrow for college. In today’s job market, most students who leave college cannot immediately find a job with the level of earnings that can support a student loan payment on top of their other living expenses. For most of them, saving for the future or making typical large purchases, such as a car, cannot happen for a period of time. According to LendEDU’s data, 60% of borrowers delay buying a car because of their debt. Not only are car purchases pushed back, but uying a home while making student loan payments is out of the question for 75% of borrowers. Sadly, a large percentage of student borrowers feel the need to postpone major life events, such as getting married and starting a family. In fact, nearly a third of borrowers find themselves moving back in with their parents. More than 70% of borrowers indicate they will have to delay saving for retirement, which will make the already elusive goal much more difficult to achieve. As it is, less than 40% of people nearing retirement have any confidence in their ability to fund their retirement income needs. Today, the number of retirees over the age of 65 with student loan debt has increased by more than 540%. To make matters worse for retirees, if they are behind on their payments or are in default, the government can garnish their Social Security benefits up to an amount that leaves you with no more than $750 in monthly benefits. Even at that rate, the amount garnished may only be enough to cover interest and fees. An increasing number of retirees will carry their student loan debt to their death. At least then their student debt will be automatically discharged (for federal loans only).